Diabetes mellitus is the most common endocrine disease and one of the most common chronic conditions in children. Type 2 diabetes and other types of diabetes, including genetic defects of beta cell function, such as maturity-onset diabetes of the young, are being increasingly recognized in children and should be considered when clinical presentation is atypical for type 1 diabetes. All children with diabetes should have access to an experienced pediatric DHC team and specialized care starting at diagnosis [Grade D, Level 4]. Children with new-onset type 1 diabetes who are medically stable should receive their initial education and management in an outpatient setting, provided that appropriate personnel and daily communication with the DHC are available [Grade B, Level 1A]. Education topics must include insulin action and administration, dosage adjustment, blood glucose (BG) and ketone testing, sick-day management and prevention of diabetic ketoacidosis (DKA), nutrition therapy, exercise, and prevention, detection, and treatment of hypoglycemia. Healthcare providers should regularly initiate discussions with children and their families about school, diabetes camp, psychological issues, substance use, obtaining a driver's license and career choices. To ensure ongoing and adequate diabetes care, adolescents should receive care from a specialized program aimed at creating a well-prepared and supported transition to adult care that includes a transition coordinator, patient reminders, and support and education, with or without a joint pediatric and adult clinic [Grade C, Level 3]. Anticipatory guidance and lifestyle counselling should be part of routine care, especially during critical developmental transitions (e.g. upon school entry, beginning high school). Children with new-onset diabetes who present with DKA require a short period of hospitalization to stabilize the associated metabolic derangements and to initiate insulin therapy. Children <6 years of age should aim for an A1C <8.0% [Grade D, Consensus]. Caution should be used to minimize hypoglycemia because of the potential association in this age group between severe hypoglycemia and later cognitive impairment [Grade D, Level 4]. Children 6–12 years of age should aim for a target A1C ≤7.5% [Grade D, Consensus]. Adolescents should aim for the same glycemic targets as adults [Grade A, Level 1A]. Clinical judgment is required to determine which children can reasonably and safely achieve these targets. Treatment goals and strategies must be tailored to each child, with consideration given to individual risk factors. Young age at diabetes onset (<7 years of age), severe hypoglycemia or chronic hyperglycemia have been associated with poorer cognitive function in a number of studies. Children with persistently poor glycemic control (e.g. A1C >10%) should be assessed by a specialized pediatric diabetes team for a comprehensive interdisciplinary assessment and referred for psychosocial support as indicated [Grade D, Consensus]. Intensive family and individualized psychological interventions aimed at improving glycemic control should be considered to improve chronically poor metabolic control [Grade A, Level 1A ]. Insulin therapy is the mainstay of medical management of type 1 diabetes. The choice of insulin regimen depends on many factors, including the child's age, duration of diabetes, family lifestyle, socioeconomic factors, and family, patient, and physician preferences. All children should be treated to meet glycemic targets. The honeymoon period, which can last up to 2 years after diagnosis, is characterized by good glycemic control and low insulin requirements (<0.5 units/kg/day). At the end of this period, more intensive management may be required to continue meeting glycemic targets. Two methods of intensive diabetes management have been used: basal-bolus regimens (long-acting basal insulin analogues and rapid-acting bolus insulin analogues) and continuous subcutaneous insulin infusion (CSII; insulin pump therapy). Children with new-onset diabetes should be started on at least 2 daily injections of bolus insulin (e.g. short-acting bolus insulin or rapid-acting bolus insulin analogues) combined with basal insulin (e.g. intermediate-acting insulin or long-acting basal insulin analogue) [Grade D, Consensus]. Increased frequency of injections [Grade D, Consensus]. Change in the type of basal and/or bolus insulin [Grade B, Level 2, for adolescents; Grade D, Consensus, for younger children]. Many pediatric studies of the long-acting basal insulin analogues, detemir and glargine, have demonstrated improved fasting BG levels and fewer episodes of nocturnal hypoglycemia with a reduction in A1C. Change to continuous subcutaneous insulin infusion therapy [Grade C, Level 3]. CSII is safe and effective and can be initiated at any age. Studies suggest that CSII may help children and adolescents improve metabolic control over basal-bolus therapy. Self-monitoring of BG is an essential part of management of type 1 diabetes. Subcutaneous continuous glucose sensors allow detection of asymptomatic hypoglycemia and hyperglycemia, but benefit in terms of improved glucose control has not been demonstrated in children. All children with type 1 diabetes should receive counselling from a registered dietitian experienced in pediatric diabetes. The effect of protein and fat on glucose absorption must also be considered. Nutrition therapy should be individualized (based on the child's nutritional needs, eating habits, lifestyle, ability and interest) and must ensure normal growth and development without compromising glycemic control. This plan should be evaluated regularly and at least annually. Features suggestive of eating disorders and of celiac disease should be systematically sought out. Hypoglycemia is a major obstacle for children with type 1 diabetes and can affect their ability to achieve glycemic targets. Children with early-onset diabetes are at greatest risk for disruption of cognitive function and neuropsychological skills, but the respective roles of hypoglycemia and hyperglycemia in their development are still questioned. Frequent use of continuous glucose monitoring in a clinical care setting may reduce episodes of hypoglycemia. In children, the use of mini-doses of glucagon (10 μg per year of age with minimum dose 20 μg and maximum dose 150 μg) should be considered in the home management of mild or impending hypoglycemia associated with inability or refusal to take oral carbohydrate [Grade D, Level 4]. In the home situation, severe hypoglycemia in an unconscious child >5 years of age should be treated with 1 mg glucagon subcutaneously or intramuscularly. In children ≤5 years of age, a dose of 0.5 mg glucagon should be given. The episode should be discussed with the diabetes healthcare team as soon as possible and consideration given to reducing insulin doses for the next 24 hours to prevent further severe hypoglycemia [Grade D, Consensus]. Dextrose 0.5–1 g/kg should be given over 1–3 minutes to treat severe hypoglycemia with unconsciousness when IV access is available [Grade D, Consensus]. Diabetes control may worsen during adolescence. Factors responsible for this deterioration include adolescent adjustment issues, psychosocial distress, intentional insulin omission and physiological insulin resistance. A careful multidisciplinary assessment should be undertaken for every child with chronic poor metabolic control (e.g. A1C >10.0%) to identify potential causative factors, such as depression and eating disorders, and to identify and address barriers to improved control. Multipronged interventions that target emotional, family and coping issues show a modest reduction in A1C with reduced rates of hospital admission. Diabetic ketoacidosis (DKA) occurs in 15% to 67% of children with new-onset diabetes and at a frequency of 1 to 10 episodes per 100 patient years in those with established diabetes. Targeted public awareness campaigns should be considered to educate parents and other caregivers (e.g. teachers) about the early symptoms of diabetes [Grade C, Level 3]. Comprehensive education and support services [Grade C, Level 3], as well as 24-hour telephone services [Grade C, Level 3], should be available for families of children with diabetes. In new-onset diabetes, DKA can be prevented through earlier recognition and initiation of insulin therapy. In children with established diabetes, DKA results from failing to take insulin or poor sick-day management. Risk is increased in children with poor metabolic control or previous episodes of DKA, peripubertal and adolescent girls, children on insulin pumps or long-acting basal insulin analogues, children with psychiatric disorders and those with difficult family circumstances. In children in DKA, administration of sodium bicarbonate should be avoided except in extreme circulatory compromise, as this may contribute to cerebral edema [Grade D, Level 4]. In children in DKA, rapid administration of hypotonic fluids should be avoided [Grade D, Level 4]. Circulatory compromise should be treated with only enough isotonic fluids to correct circulatory inadequacy [Grade D, Consensus]. 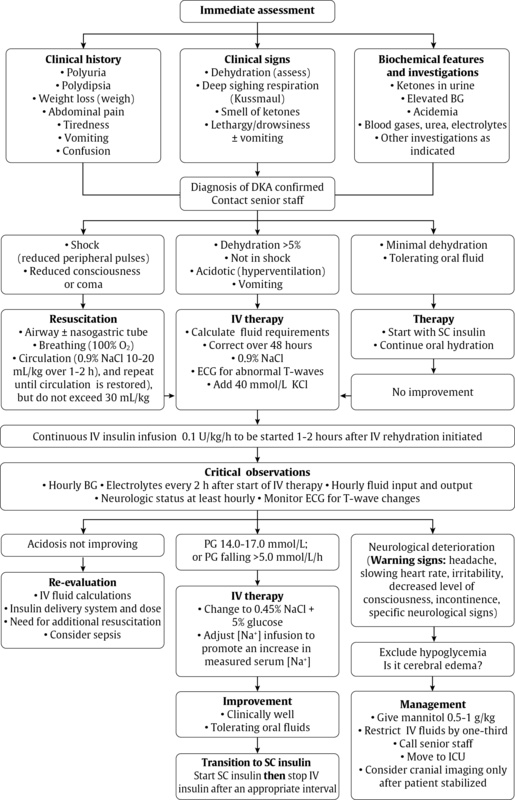 Restoration of extracellular fluid volume should be extended over a 48-hour period with regular reassessments of fluid deficits [Grade D, Level 4]. In children in DKA, IV insulin bolus should not be given; an IV infusion of short-acting insulin should be used at an initial dose of 0.1 units/kg/h [Grade D, Level 4]. The insulin infusion should not be started until 1 hour after starting fluid replacement therapy [Grade D, Level 4]. In children in DKA, the insulin infusion rate should be maintained until the plasma anion gap normalizes. Once plasma glucose reaches 14.0–17.0 mmol/L, IV glucose should be started to prevent hypoglycemia [Grade D, Consensus]. Currently, there is no evidence supporting increased morbidity or mortality from influenza or pneumococcus in children with type 1 diabetes. Influenza immunization should be offered to children with diabetes as a way to prevent an intercurrent illness that could complicate diabetes management [Grade D, Consensus]. Smoking is a significant risk factor for both macrovascular and microvascular complications of diabetes and, in adolescents, is associated with worse metabolic control. Adolescent females with type 1 diabetes should receive counselling on contraception and sexual health in order to prevent unplanned pregnancy [Grade D, Level 4]. Pregnancy in adolescent females with type 1 diabetes with suboptimal metabolic control may result in higher risks of maternal and fetal complications than in older women with type 1 diabetes who are already at increased risk compared to the general population. For children, and particularly adolescents, there is a need to identify psychological disorders associated with diabetes and to intervene early to minimize the impact over the course of development. Children and adolescents with diabetes have significant risks for psychological problems, including depression, anxiety, eating disorders and externalizing disorders. The risks increase exponentially during adolescence. Studies have shown that psychological disorders predict poor diabetes management, control and consequently, negative medical outcomes. As glycemic control worsens, the probability of psychological problems increases. 10% of adolescent females with type 1 diabetes meet the DSM-4 criteria for eating disorders compared to 4% of their age-matched peers without diabetes. Eating disorders are associated with poor metabolic control and earlier onset and more rapid progression of microvascular complications. Adolescent females with type 1 diabetes should be regularly screened using non-judgemental questions about weight and body image concerns, dieting, binge eating and insulin omission for weight loss [Grade D, Consensus]. Children and adolescents with diabetes, along with their families, should be screened regularly for psychosocial or psychological disorders [Grade D, Level 4] and should be referred to an expert in mental health and/or psychosocial issues for intervention when required [Grade D, Consensus]. Children and adolescents with diabetes, along with their families, should be screened throughout their development for psychological disorders. Psychological interventions with children and adolescents, as well as families, have been shown to improve mental health, including overall well-being and perceived quality of life, along with depressive symptoms. There is some evidence that psychosocial interventions can positively affect glycemic control. Clinical autoimmune thyroid disease (AITD) occurs in 15% to 30% of individuals with type 1 diabetes. The risk for AITD during the first decade of diabetes is directly related to the presence or absence of thyroid antibodies at diabetes diagnosis. Hypothyroidism is most likely to develop in girls at puberty. Early detection and treatment of hypothyroidism will prevent growth failure and symptoms of hypothyroidism. Children with type 1 diabetes who have thyroid antibodies should be considered high risk for autoimmune thyroid disease [Grade C, Level 3]. Children with type 1 diabetes should be screened at diabetes diagnosis with repeat screening every 2 years using a serum thyroid-stimulating hormone and thyroid peroxidase antibodies [Grade D, Consensus]. More frequent screening is indicated in the presence of positive thyroid antibodies, thyroid symptoms or goiter [Grade D, Consensus]. Celiac disease can be identified in 4% to 9% of children with type 1 diabetes, but in 60% to 70% of these children the disease is asymptomatic (silent celiac disease). Children with type 1 diabetes are at increased risk for classic or atypical celiac disease during the first 10 years of diabetes. Children with type 1 diabetes and symptoms of classic or atypical celiac disease should undergo celiac screening [Grade D, Consensus] and, if confirmed, be treated with a gluten-free diet to improve symptoms [Grade D, Level 4] and prevent the long-term sequelae of untreated classic celiac disease [Grade D, Level 4]. Parents should be informed that the need for screening and treatment of asymptomatic (silent) celiac disease is controversial [Grade D, Consensus]. Screening for microalbuminuria should be performed annually, commencing at 12 years of age in children with type 1 diabetes >5 years' duration [Grade D, Consensus]. Children ≥12 years should be screened for microalbuminuria with a first morning urine ACR (preferred) [Grade B, Level 2] or a random ACR [Grade D, Consensus]. Abnormal results should be confirmed [Grade B, Level 2] at least 1 month later with a first morning ACR or timed, overnight urine collection for albumin excretion rate [Grade D, Consensus]. Microalbuminuria (ACR >2.5 mg/mmol) should not be diagnosed in children ≥12 years unless it is persistent, as demonstrated by 2 consecutive first morning ACR or timed collections obtained at 3- to 4-month intervals over a 6- to 12-month period [Grade D, Consensus]. Microalbuminuria is rare in pre-pubertal children, regardless of the duration of diabetes or metabolic control. The likelihood of transient or intermittent microalbuminuria is higher during the early peripubertal years and may place individuals at increased risk of progression to overt nephropathy. Children ≥12 years with persistent microalbuminuria should be treated per adult guidelines [Grade D, Consensus]. One short-term randomized controlled trial in adolescents demonstrated that angiotensin-converting enzyme (ACE) inhibitors were effective in reducing microalbuminuria compared to placebo. However, there are no long-term intervention studies assessing the effectiveness of ACE inhibitors or angiotensin II receptor antagonists in delaying progression to overt nephropathy in adolescents with microalbuminuria. In children ≥15 years of age with type 1 diabetes, screening and evaluation for retinopathy by an expert professional should be performed annually, starting 5 years after the onset of diabetes [Grade D, Consensus]. The screening interval can be increased to every 2 years in children with type 1 diabetes who have good glycemic control, duration of diabetes <10 years and no significant retinopathy (as determined by an expert professional) [Grade D, Consensus]. When present, neuropathy is mostly subclinical in children. With the exception of intensifying diabetes management to achieve and maintain glycemic targets, no other treatment modality has been studied in children and adolescents. Postpubertal children with type 1 diabetes of >5 years' duration and poor metabolic control should be questioned about symptoms of numbness, pain, cramps and paresthesia, and examined for skin sensation, vibration sense, light touch and ankle reflexes [Grade D, Consensus]. Most children with type 1 diabetes should be considered at low risk for vascular disease associated with dyslipidemia. Children with type 1 diabetes who are <12 years of age should be screened for dyslipidemia if they have other risk factors, such as obesity (body mass index >95th percentile for age and gender) and/or a family history of dyslipidemia or premature cardiovascular disease. Routine screening for dyslipidemia should begin at 12 years of age, with repeat screening after 5 years [Grade D, Consensus]. Once dyslipidemia is diagnosed in children with type 1 diabetes, the dyslipidemia should be treated per lipid guidelines for adults with diabetes [Grade D, Consensus]. Up to 16% of adolescents with type 1 diabetes have hypertension. Children with type 1 diabetes and BP readings persistently above the 95th percentile for age should receive lifestyle counselling, including weight loss if overweight [Grade D, Level 4]. If BP remains elevated, treatment should be initiated based on recommendations for children without diabetes [Grade D, Consensus]. The change of physician or DHC team can have a major impact on disease management and metabolic control in the person with diabetes. Between 25% and 65% of young adults have no medical follow-up during the transition from pediatric to adult diabetes care services. Those with no follow-up are more likely to experience hospitalization for DKA during this period. Organized transition services may decrease the rate of loss of follow-up. If you would like more details on this topic, please visit the Canadian Diabetes Association Clinical Practice Guidelines: Chapter 34.